This is the Werks 34mm "Light" Pro Clutch 4 Shoe Racing Clutch System. Clutch tuning is one of the most important aspects of 1/8 scale nitro racing. No one likes to disassemble their clutch to change the shoes or springs, but changing track conditions over the course of a race day make clutch tuning a skill that racers must develop to put themselves at the top of the podium. A system that simplifies this task is something that racers and bashers have been begging for. Werks Racing has once again stepped up to the plate to provide you with the tools you need to lead, with the “Pro Clutch”; a clutch system that not only offers the ultimate in simplicity, but also incredible lifespan and flexibility! 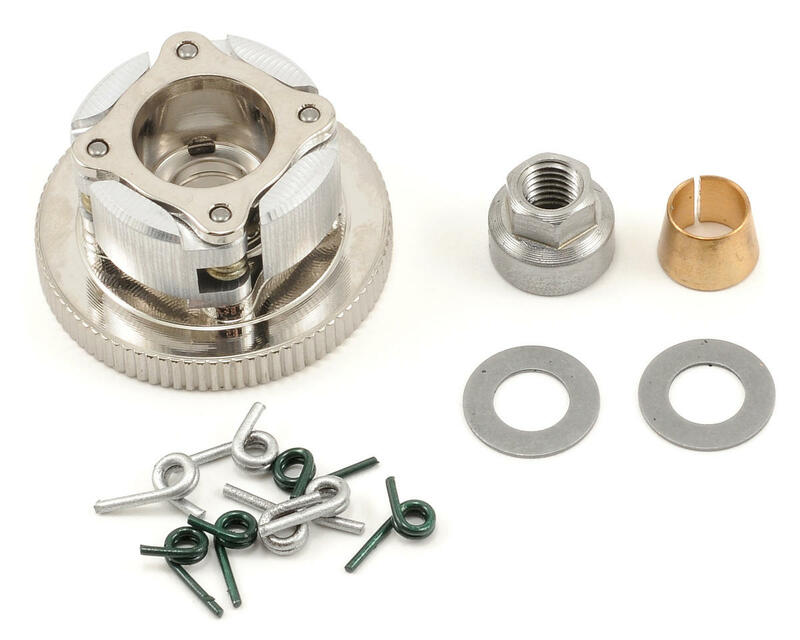 The "Pro Clutch" uses a proven system for the easiest possible assembly and removal. The shoes and springs are installed by sliding them over the flywheel pins, then the top plate slides on and with a 1/4 turn twist to load the springs you are done! It takes 10-15 seconds to assemble the complete clutch! As an added bonus the clutch does not need to be disassembled when it is removed from the engine. Simply remove the clutch nut, and pull it off the crank! This design allows you to store a pre-assembled clutch in your pit box for a quick swap of the entire clutch. This system becomes a powerful tuning option when you take advantage of the different weight flywheels! The "Pro Clutch" is offered in three different flywheel weights, and each weight is available in both 32mm and 34mm diameters, allowing you to choose the flywheel that best suits your needs. This is useful in that it allows you to keep multiple clutches on hand in different weights to tune for different track conditions. There are two different Steel flywheels: heavy and medium. These can be used to tune for low traction surfaces, as well as to smooth out low RPM power delivery on engines that have a strong bottom end hit. There is also a super lightweight Aluminum flywheel that can be used on high traction surfaces and to provide a little extra bottom end snap from your engine. 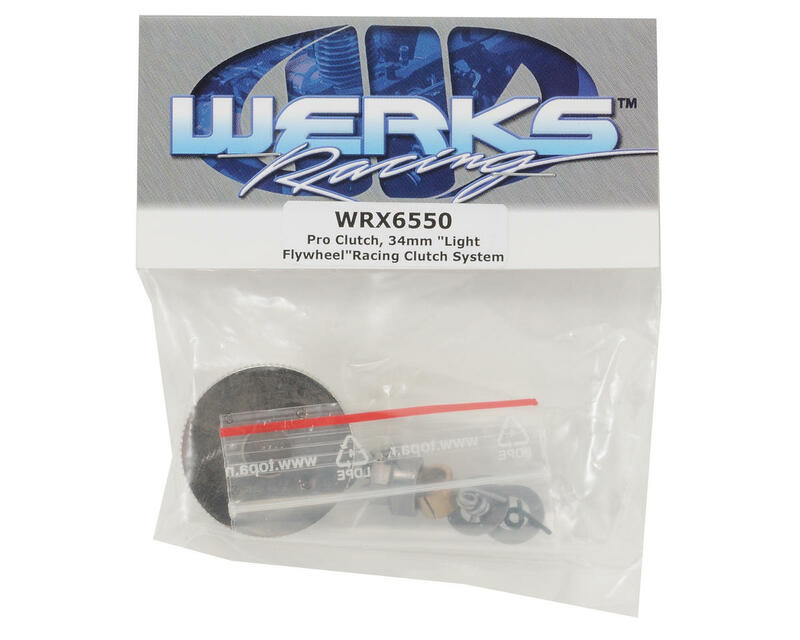 The Werks Pro Clutch includes a set of four "Long Life" aluminum clutch shoes that have been proven to outlast the competition, as well as a complete set of 0.9mm, 1.0mm & 1.1mm springs to tune the engagement point of the clutch. Additionally, super hard clutch pins are also standard, making notching and clutch pin wear a thing of the past. The flywheel also has a special coating that not only provides a bit of "bling", but also a slippery, non stick finish that significantly reduces the likelihood of gunk or debris getting stuck on the flywheel under the clutch shoes causing them to hang up. The new Werks "Pro Clutch" system provides a greater level of tunability, incredible performance and ease of assembly that has no rival! Get Werks, or get worked! Running in a D8 with a Novarossi plus 4, best clutch on the market. Installed on both an FX 5K DC, RB Concepts B9 and put into an Xray XB8 2019. The stock Xray bell fits perfectly, and lines up well for the buggies gear mesh. The clutch performed well on both motors, and has excellent full lock-up with good punch out of the corner. If you have new tires you will visibly see your buggy launch hard. On lower traction tracks, or in loam off the racing line you could get a bit too much punch, so be mindful of the snap it creates at the bottom. If this clutch does not lock up, you have grease or oil in the clutch bell, because it locks up well! After a full gallon, the shoes have just worn to a perfect break-in and are now ready to race. I will purchase a second clutch as this one will be set aside for race day. I will test the new one with two carbon shoes hoping for a slightly softer engagement. As for a-main, I am impressed by the selection and have never had an issue. Good job so far! Note: I am running the 32MM flywheel for Xray. This clutch is where its at. I ran the stock MBX6R with good. I decided it was time to upgrade to the Werks Pro 4 Shoe "Light" and I can tell you Im glad I did. This clutch provides plenty of low end snap and grab that it just propels my buggy to new levels of performance. Our local track has a 90* left-hander with a quad coming up immediately , most will make it a double double because any more will be very risky and I always played it the same, the first trip out with the Werks Pro 4 was very pleasing, I exited the turn into the quad with a quick blip off the throttle like usual, but to my surprise I turned it into a triple, rolled the last jump in the set, lined up for the straight, away smashed the throttle and she was gone. The Werks Pro 4 Shoe is worth every penny in my book. If you're having low end torque trouble with a Werks Light Pro 4, then you need to either tune your mill or you have bigger issues. I ran the light clutch to get the most bottom end punch to suit my driving style and I was a bit disappointed in 4 things. First, the springs are either too soft or too stiff. I tried several combinations and it certainly is the smoothest clutch I've used but not punchy. Second the shoes seemed to slip on the clutch bell more than a stock 3 shoe. It's like a mid-range slip on power. Very irritating. Third, during assembly it doesn't go together quite as easily as it should. The extra holes added to make fine adjustments don't let it seat properly without some effort. Fourth, the springs sometimes break, the soft ones, the only ones that allow it to engage properly. The 1.0 medium ones felt too stiff for buggy and I cant even imagine what the 1.1 springs are used for. I ended up with 2 soft 2 medium springs for the best clutch action I could get out of this. Perhaps I'm just used to the old school 3 shoe clutch. is the best clutch on the market for the price , no scrach , shoes pad is really tough. i dont have the L clutch but i have the M clutch for the B5 and B6 on my mugen's and they didnt lien up so i got the protek clutch bell's and it fits so try that. I bought this clutch system for my Losi EIGHT T 2.0. I tried to install it on my Novarossi P5 XLT .21, but for some reason it won't fit right to my clutch bell. I have tried shimming, but when the nut is tight, the bearings are in a bind (won't spin freely). Any info about this would be greatly appreciated. I assume that I have the wrong shims, but they come with the set-up. HELP! !